The refugee and asylum channel is one of three channels through which aliens can legally immigrate to the United States. The others are through employment and family creation/family reunification (see Spotlight on Legal Immigration to the United States). This updated Spotlight closely examines the data on persons admitted to the United States as refugees or those granted asylum in 2005. It also provides the number of refugees and asylees receiving lawful permanent resident status (LPR) in 2005. The data come from the 2005 Annual Flow Report on Refugees and Asylees and the 2005 Yearbook of Immigration Statistics, published by the Department of Homeland Security's Office of Immigration Statistics (OIS). Note: all yearly data is for the government's fiscal year (October 1 through September 30). 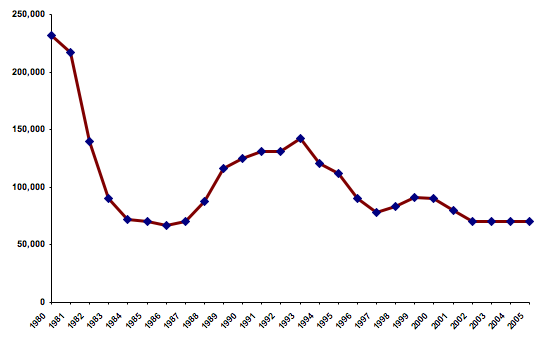 Unlike Annual Flow reports, previous OIS publications on refugees and asylees included information on the number of applications submitted, approved, and denied in addition to the number of persons admitted as refugees or granted asylum (see 2004 Yearbook of Immigration Statistics data tables). Aliens seeking asylum in the United States can submit an asylum request in one of two ways. The annual ceiling for refugees admitted to the United States through the resettlement program has declined 70 percent in the last 26 years. More than 53,000 refugees were admitted to the United States through the resettlement program during 2005. Nationals of 10 countries accounted for 86 percent of all refugee arrivals in 2005. California, Minnesota, and Florida accounted for more than a third of all refugee resettlements. More than 25,000 individuals (principals and their immediate family members) were granted asylum in 2005. China, Colombia, Haiti, and Venezuela accounted for half of all persons granted asylum in 2005. More than 143,000 refugees and asylees adjusted their status to LPR in 2005. The number of refugees who adjusted their status to LPR nearly doubled, and the number of asylee adjustments nearly tripled, between 2004 and 2005. Refugees: Applications for resettlement to the United States are compiled by Overseas Processing Entities (OPEs) and the United Nations High Commissioner for Refugees (UNHCR) on behalf of refugees. Applications are submitted to U.S. Citizenship and Immigration Services (USCIS). After approval for resettlement, a principal applicant, either alone or with his or her close family (spouses, minor unmarried children, and dependent parents), is eligible to come to the United States through the refugee resettlement program. USCIS collects data on refugees when their applications are submitted abroad through the OPEs or UNHCR, when they arrive in the United States for resettlement, and when they adjust their status to LPR. Refugees and their family members (spouses and children older than 14) are entitled to work in the United States and to other kinds of services and assistance. Asylees: According to the U.S. Refugee Act of 1980 and based on the 1951 UN Refugee Convention, any aliens, whether their current immigration status is legal or not, who are physically present in the country or at a port of entry may apply for asylum. An asylum seeker acquires asylee status when his or her application has been processed and approved and asylum is granted. A person granted asylum in the United States is entitled to a social security card, employment authorization, and other assistance. Annual limits on admission: While there is an annual limit on the number of refugee admissions, no such cap exists on the number of asylum applications or approvals for asylum. Adjustment to LPR: Both refugees and asylees are eligible to apply for lawful permanent resident (LPR) status after one year of continuous presence in the United States in their respective status of refugee or asylee. Whereas there have been no annual limitation on the number of refugees eligible to adjust to LPR, the 10,000-per-year limit on asylee-status adjusters was eliminated in 2005 as a result of the REAL ID Act. In the United States, the main difference between these two groups of people is the location of the person at the time of application — the refugees are generally outside of the United States when they are considered for resettlement, whereas asylum seekers submit their applications while they are physically present in the United States or at a port of entry. Besides the definitional difference, refugees and asylees are different in the way they are treated by immigration and refugee law at the time of application, admission, and adjustment of their status to lawful permanent resident (LPR) status (see sidebar). An asylum seeker present in the United States may submit an asylum request either with a United States Citizenship and Immigration Services (USCIS) asylum officer or, if apprehended, with an immigration judge as part of a removal hearing. If the case is denied, an applicant may appeal for additional hearings with the Board of Immigration Appeals or, in some cases, with federal courts. Aliens may also request asylum at the port of entry. They are usually referred to the Asylum Officer Corps for "credible fear" interviews. The goal of such interviews is to determine whether asylum seekers are eligible to apply for asylum or for withholding of removal. If the Asylum Officer Corps determines the asylum seeker has a credible fear of return, the case is referred to an immigration judge. The admission ceiling for refugees has declined 70 percent, from 231,700 in 1980, when it was first introduced, to 70,000 in 2005 (see Figure 1). There is a ceiling on refugee admission worldwide and by region. The president, in consultation with Congress, sets the ceilings at the beginning of each fiscal year. The ceilings are not quotas, meaning that the established limits do not have to be met (see Spotlight on the U.S. Refugee Program). In 2005, the overall ceiling was 70,000, with the ceiling for Africa at 20,000, East Asia at 13,000, Europe at 9,500, Latin America and the Caribbean at 5,000, and the Near East and South Asia at 2,500; 20,000 were unallocated. In 2005, 53,813 individuals were admitted to the United States as refugees. This figure represented a two percent increase compared to the corresponding number in 2004 (52,868) and an 89 percent increase compared to the number in 2003 (28,422) (see Figure 2). Source: 2003 Yearbook of Immigration Statistics and 2005 Annual Flow Report on Refugees and Asylees. Note: Prior to 1996, refugee arrival data were derived from the Nonimmigrant Information System of the Immigration and Naturalization Service. Beginning in fiscal year 1996, arrival data for all years are from the Bureau for Refugee Programs (BRP), Department of State. 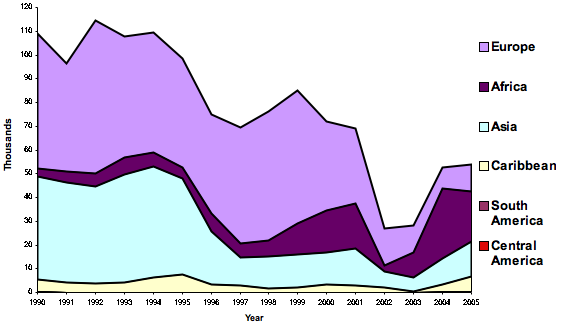 Any comparison of refugee arrival data prior to 1996 must be made with caution. Altogether, nationals of the top 10 countries made up 85.9 percent of the 53,813 refugee arrivals in 2005 (see Table 1). These countries include Somalia, Laos, Cuba, Russia, Liberia, Ukraine, Sudan, Vietnam, Iran, and Ethiopia. Laos, Cuba, and Vietnam replaced three countries from the top-10 list in 2003: Serbia-Montenegro, Afghanistan, and Sierra Leone. 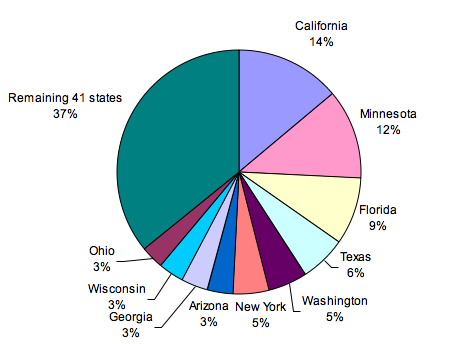 In 2005, 34.7 percent (18,666) of all refugees were resettled in California, Minnesota, and Florida. Another 29.4 percent (15,811) were resettled in Texas, Washington, New York, Arizona, Georgia, Wisconsin, and Ohio (see Figure 3). Altogether, these 10 states accounted for more than two-thirds of all refugee arrivals. The number of principals and their immediate family members who were granted asylum in 2005 was 25,257. This represented a seven percent decline compared to the corresponding number in 2004 (27,169) and a 12 percent decline compared to the number in 2003 (28,684). Of the 25,257 asylees, 54 percent (13,520) were granted asylum affirmatively (ie, with a USCIS asylum officer) and 46 percent (11,737) were granted asylum defensively (ie, with an immigration judge as part of a removal hearing). More than 5,000 nationals of the People’s Republic of China, 3,375 nationals of Colombia, 2,962 nationals of Haiti, and 1,114 nationals of Venezuela were granted asylum, accounting for 50.4 percent of all individuals who received asylum status in 2005 (see Table 2). Of the 142,962 refugees and asylees who adjusted their status to LPR in 2005, 112,676 (78.8 percent) were refugees and 30,286 (21.2 percent) were asylees. 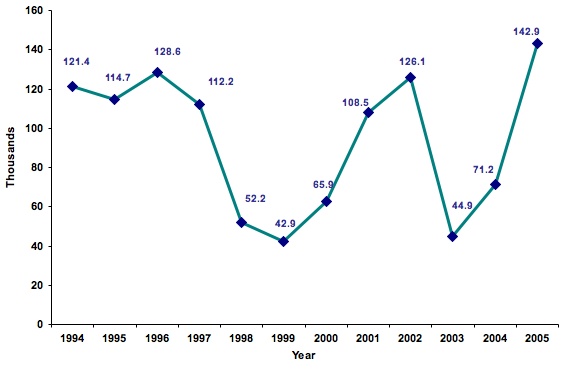 The number of refugees and asylees who adjusted their status to LPR has fluctuated greatly between 1994 and 2005 (see Figure 4). In 2004, only 61,013 refugees adjusted their status compared to 112,676 in 2005. The number of asylees who became LPRs in 2005 (30,286) nearly tripled compared to 10,217 in 2004, mostly thanks the REAL ID Act, which removed the 10,000-per-year limit on the number of asylees who could adjust to LPR status. The Annual Flow Report on Refugees and Asylees: 2005. Available online. The Yearbook of Immigration Statistics: 2005. Available online.